An oasis for animals in the hustle and bustle of JFK. The 236 homing pigeons stranded at New York’s John F. Kennedy International Airport had a race to get to. Their owner, John Nelson, had packed them into five crates and driven nearly 11 hours from Michigan to New York to catch a flight bound for Zimbabwe. Nelson had mostly driven through the night while the pigeons were asleep. After the long road trip, their travel plans were halted. Mechanical problems had grounded their plane. The next day there was another delay. A new plane was ready to go, but it had reached weight capacity shortly before takeoff. Most of the passengers were allowed to fly, but the birds remained on the runway, nearly 8,000 miles from their final destination — The Victoria Falls World Challenge Pigeon Race. While at the airport, the pigeons checked into a state-of-the-art luxury animal hotel of sorts — The ARK at JFK, where they were given fresh water, food and a warm place to stay while they awaited a new aircraft. Schuette and her husband, co-founder John J. Cuticelli Jr. P ’98, opened The ARK last year. Billed as the world’s first privately owned, 24/7 animal terminal and airport quarantine center, it sits on 14.4 acres. The ARK aims to create a safer travel experience for horses, birds, livestock, dogs, cats and exotic animals. For international imports, that experience may begin at the aircraft, cargo warehouse or passenger terminal and end at The ARK facility, which is equipped with a quarantine center and veterinary clinic. ANIMAL KINGDOM: The ARK's facilities at JFK are designed to house the wide variety of animals in their care. “We are hoping to make a significant impact on the industry as a whole by showing how animals should be treated in travel,” Schuette says. The ARK sits a few miles from JFK’s main passenger terminals. It’s a modern 178,000 square-foot chevron-shaped building located in a cargo building of JFK. Once guests are buzzed into the facility they are led to a check-in counter that resembles one carefully crafted for a high-end hotel. Cuticelli was brought in by a Cornell-educated veterinarian. While both Cuticelli and Schuette had business savvy from years of working in the banking and real-estate industries, the care of animals in travel was new territory. They needed to do research and somehow get a front-row seat to how the industry worked. The answer was to offer a one-stop shop that combined aspects of all the airports he visited. They also partnered with Cornell University’s College of Veterinary Medicine to implement the correct health, safety, bio-security procedures and protocols for handling the animals and operating the facility. Airline passengers who don’t want their pet to stay in a crate for extended periods of time before, after or between flights, can bring their pets to The ARK, which offers 63 kennels for dogs and cats at a starting rate of $125 per pet at the Pet Oasis. William and Deni McChesney heard about The ARK shortly after it opened in early 2017. The couple enjoys traveling and goes to England several times a year with their West Highland white terrier, Birdie. “If you love animals and pets as much as we do and travel as much we do, The ARK is our salvation,” says William McChesney, a two-time customer. William McChesney says that since there is no guarantee that Birdie will be on the same flight as he and his wife, using The ARK assures them that she is being treated well if a flight delay occurs. 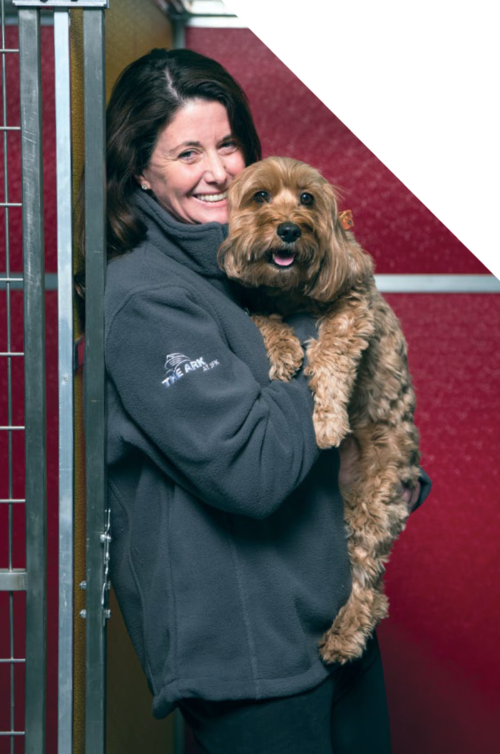 While the commercial flight animal care segment of the business is the most popular, the capability to provide animal quarantine services at the facility makes The ARK an anomaly in the industry. The U.S. Department of Agriculture visits The ARK frequently to examine the animals and to make sure their health certificates are accurate and that they are fit to fly. If they do not meet the standards of the USDA, they must stay longer at the facility or are treated at the onsite animal hospital. Livestock that fly are required to rest two hours before boarding a plane under USDA rules. Incoming birds must be quarantined for 30 days. Schuette transferred to William & Mary from the University of Iowa the second semester of her freshman year when her family moved to Virginia. She was a pre-med major, but switched to economics her sophomore year. Interestingly, the couple’s daughter, Dr. Elena Cuticelli Garrett ’98, followed in Schuette’s original path at William & Mary by majoring in pre-med. She is now an emergency room doctor in Newport News, Va., and resides in Toano. After graduation Schuette worked for Booz Allen Hamilton as a consultant to the Navy and attended graduate school at George Washington University. She spent 11 years working in the banking industry before joining her husband as a real estate broker. Though her career has varied from banking to real estate, it never touched the world of animals until The ARK. She says that flexibility comes from her W&M education. While dogs, cats and horses are the most common guests at The ARK, exotic animals are also welcome — although there are times when even Schuette and Cuticelli are surprised by the animal guests who come through their door. A man on the phone attempted to give her more clarity. He said the animals were being transported from a South American zoo to a zoo in China. He described them as 10 large rats. They were not rats at all. They were capybaras, a large rodent that is native to South America. Making the animal guests comfortable is a top priority for the couple, even if it means turning on some music. In order to make horses feel at home during their boarding period, their stalls have plush padding, shavings and other materials. Pavarotti or other opera singers are often heard in the background as they rest. “Music has been shown to calm animals,” says Schuette, who says that some horses even lie down in their stalls. Most of The ARK horses are traveling to Amsterdam or Belgium. Some are headed to Korea or other parts of Asia. The competitive horses compete in the equine jumping events or other sporting events around the world. The majority of the birds, which include macaws, parrots and more exotic types, come from South America or Africa and are usually en route to Europe or China, Schuette says. Schuette says there are different factors to consider when transferring animals compared to non-living cargo such as household goods and retail shipments. In the U.S., 2 million pets and other live animals travel by air every year, according to the U.S. Department of Transportation. While most arrive safely, there are some rare instances where animals do not make it to their destinations unscathed due to loss, injury or death. The U.S. Department of Transportation tracks and publishes this data monthly in Air Travel Consumer Reports. From January to August 2017, the most recent data released, 15 animals died, eight were injured and one was lost during a flight. During the same period in 2016, 15 animals died and 15 were injured while aboard an aircraft. There were no reports of animals being lost during this period. Sometimes there are no signs that a pet may not make it to their destination, even when they have been examined by a veterinarian prior to being loaded onto the airplane. This was true for an Australian shepherd in August. A necropsy determined that the puppy died from a heart attack. The monthly U.S. Department of Transportation reports are forwarded to the USDA, which is responsible for enforcing the federal Animal Welfare Act that was put in place to protect animals. According to Schuette, The ARK seeks to mitigate these instances by providing a calm, safe environment with food, water and relief pre- and post-flight. The care animals receive at these critical times can improve the experience and make flying less stressful. The ARK is an animal pit stop in a way. Sometimes they are headed to a big race, getting ready to board an airplane, en route to meet their owners for the first time or just resting their wings before a flight. Each day animals check in and check out of The ARK. Many will only travel a few miles once they leave, while others are bound for distant destinations — time zones away from JFK airport. But just like in an airport where thousands of people cross paths briefly, for a moment The ARK connects them. Inside The ARK’s Pet Oasis the guests’ names are written on a small whiteboard: Bira, Bak and Toni. They are three German shepherds, whose jobs are to sniff out bombs and locate humans for the military. Three puppies sit in their kennels nearby. Two are French bulldogs and the other is a black Yorkshire terrier without a name. The black terrier arrived in a carry-on crate with another puppy in early October from Ukraine. His companion died during the flight to the airport. The kennel they were stored in was too small to carry them both. At only a few weeks old, they were also too young to travel on the long flight, Schuette said. The surviving black terrier was near death when he came to The ARK. In order to properly care for him and ensure the safety of others, the tiny black terrier was placed in the quarantine area to make sure he didn’t have rabies or other diseases. The puppy was nameless and homeless. Inside The ARK he had found a safe space — a space where there were plenty of willing arms to hold and care for him. He eventually left The ARK. A family in his home country of Ukraine adopted him. He had arrived in New York without a name and dehydrated, but he left healthy and with a new identity. He is no longer just an abandoned black Yorkshire terrier.